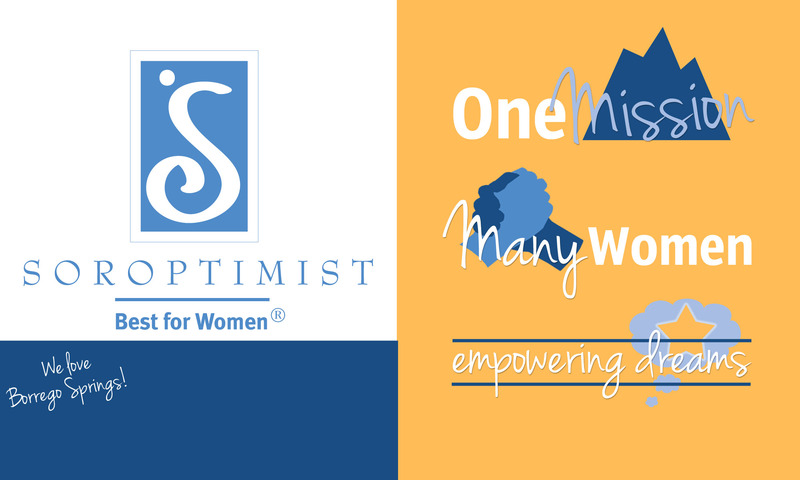 Soroptimist is a global women’s organization whose members work to improve the lives of disadvantaged women and girls through programs leading to social and economic empowerment. Soroptimist programs focus on providing disadvantaged women and girls with access to education, which is one of the most effective ways to end social problems disproportionately affecting women and girls. Soroptimist members belong to local clubs, such as our local group in Borrego Springs, California. Clubs participate in the Dream Programs of Soroptimist, Live Your Dream: Education and Training Awards for Women and Dream It, Be It: Career Support for Girls to help women and girls achieve social and economic empowerment. The Dream Programs of Soroptimist ensure women and girls have access to the education and training they need to reach their full potential and live their dreams. Soroptimist is committed to investing in programs that have a sustainable, measurable change for women and girls.